When Matthew and Terces Engelhart first became sweethearts, they promised to live their lives together following and trusting intuition. 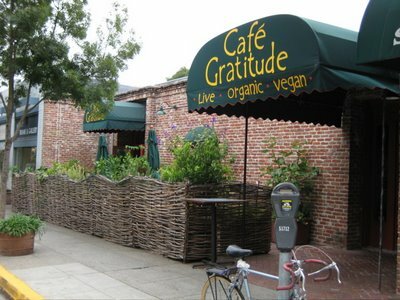 Café Gratitude is their expression of a world of plenty. Our food and people are a celebration of our aliveness. We select the finest organic ingredients to honor the earth and ourselves, as we are one and the same. We support local farmers, sustainable agriculture and environmentally friendly products. Our food is prepared with love. We invite you to step inside and enjoy being someone that chooses: loving your life, adoring yourself, accepting the world, being generous and grateful every day, and experiencing being provided for.